High Priestesses, Sideshow Freaks, Criminals, Slaves, Victorians, Royalty, Tribeswomen, Models, Scythinans, Tharacians, Rus, Britons, Nubians, Maori, Polynesian, Chinese, Greek, and Roman. 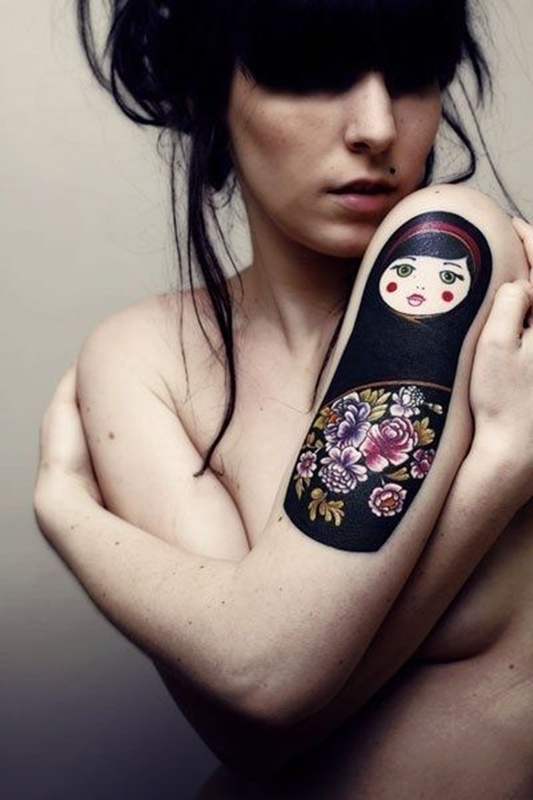 The common denominator between these occupations and cultures is the prevalence of tattooed women in their history. The mummified remains of an Egyptian High Priestess Amunet date back to 2000 B.C. and show evidence of the distinguished woman’s many tattoos. 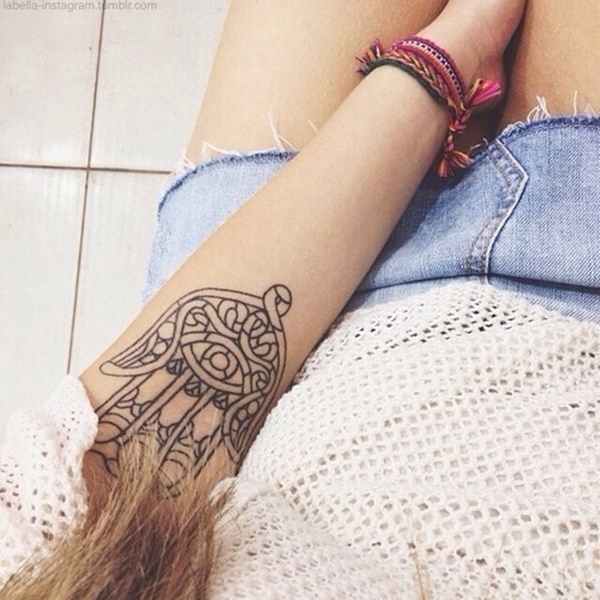 Throughout the centuries tattooing has gained and lost popularity in many cultures. While tattooing was occasionally fashionable for the ancient Greeks and Romans they also used body art to identify members of religious sects, criminals, and slaves. The Britons were recounted as having blue tattoos covering their bodies. To such an extent the Roman nickname for one of the tribes was the “Picti” or painted people. 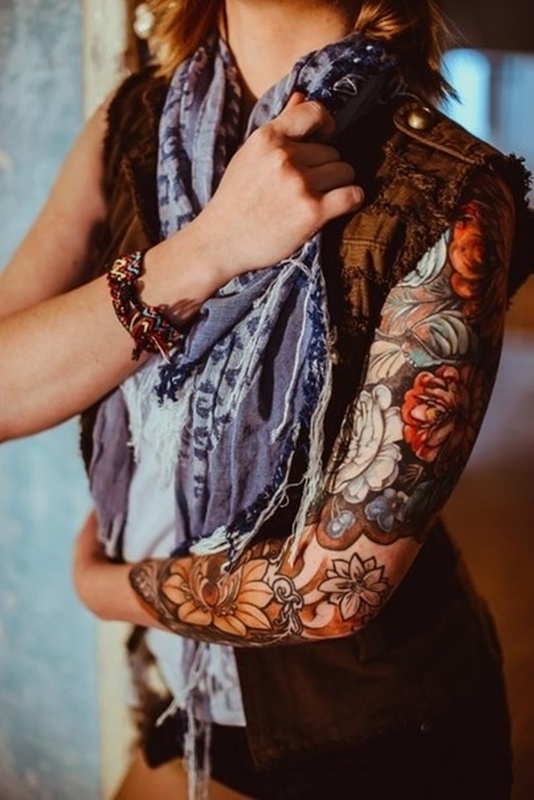 Despite modern misconceptions women have had an undeniable role in the evolution of tattoos and this article presents you with 100 photos to inspire your next ink session. 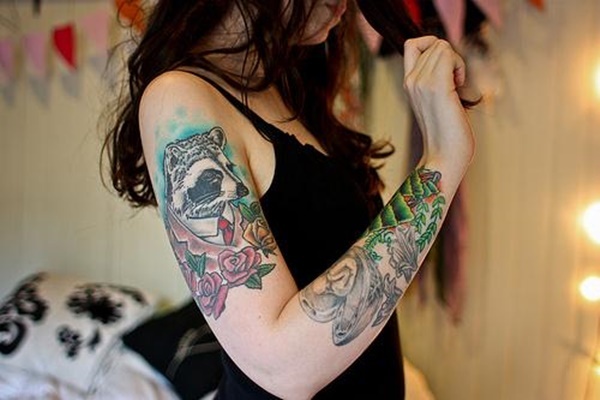 Consider the color consistency whenever you are planning on a full sleeve. Clashing colors can make your arm seem cluttered and the individuals become indistinct. 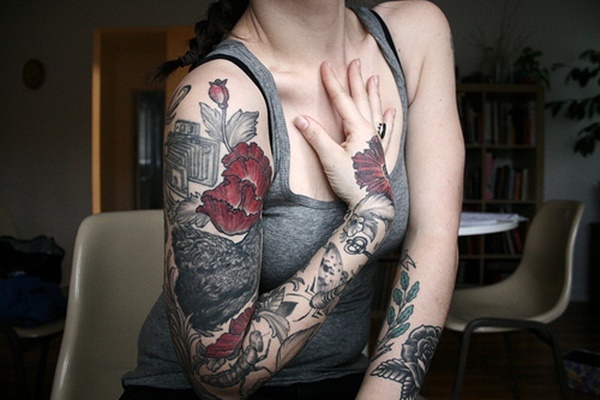 Tattoos are a beautiful expression of femininity. Notice the exaggerated amount of rouge on the cheeks of the pin up girl and how well it compliments the color of the flowers that run down the wearer’s arm. Tiger lilies, lotuses, roses and other flowers create beautiful motifs regardless of whether they are incorporated in a single piece or stand alone as a single image. This woman’s arm sports a number of traditional images including the skull with Mexican “Day of the Dead” embellishments, the tiger, demon, pin-up girl and butterfly. While the images were tattooed separately the placement and proximity of the pieces give the effect of a full sleeve. Even with a simple color palette like black, red, and green, flowers create a beautiful image. 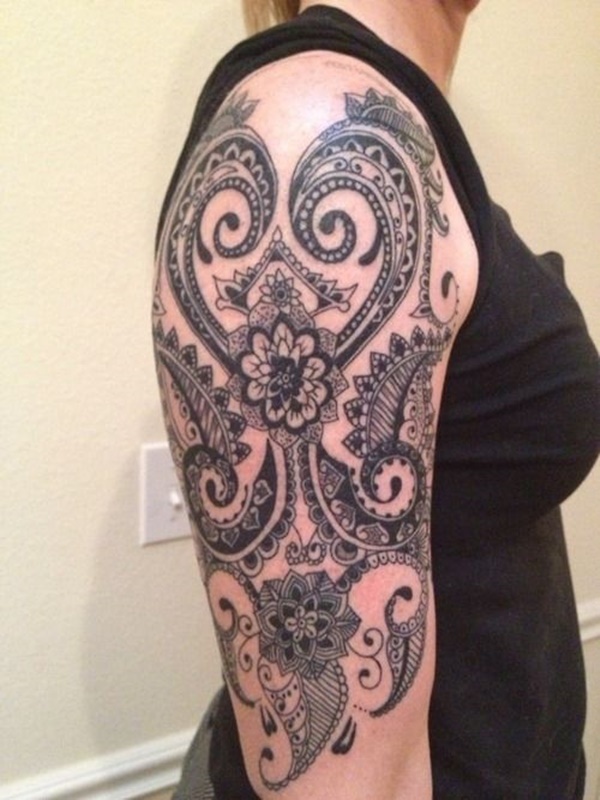 This is a beautiful example of a black and gray tattoo accented by subtle splashes of red. The red geometric pattern above the picture compliments the small berries and vice versa. Without the geometric pattern the cherries would seem out of place and without the cherries the geometric pattern would look separated from the rest of the tattoo. Peacocks are symbol of beauty and flamboyance. The peacock’s bright colors and striking feather pattern exist because of the bird’s evolutionary need to attract mates. The peacock feather is a design world staple as a symbol of beauty and makes an eye catching tattoo. Exceptional line work is the secret behind this alluring black and gray piece. A simple concept was turned into something extraordinary due to a thorough understanding between tattoo artist and customer. A portrait of a gypsy woman adorns this woman’s upper arm as roses and serpents descend her forearm. 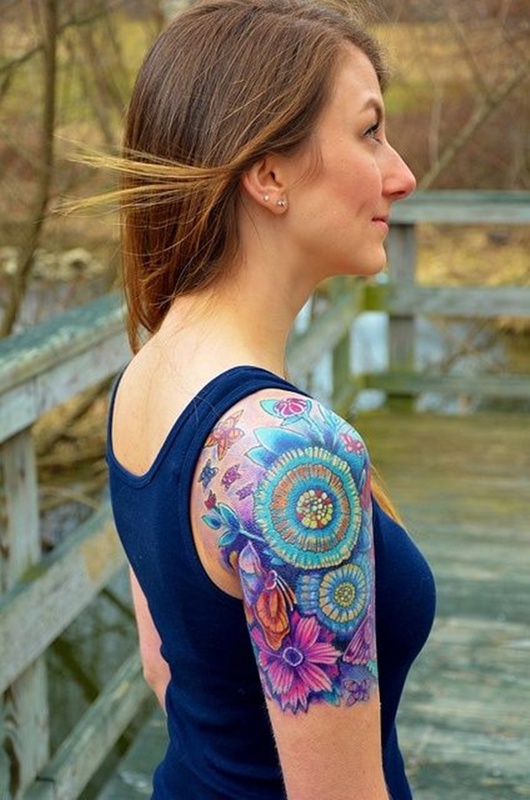 However, every tattoo on this woman’s right arm has a similar color that makes the illustrations cohesive while keeping the images from clashing. Something as simple as a series of lines can turn an arm into art. A portrait of a woman with horns, a buck, a hinged key. Your tattoos are an expression of your personality as well as an opportunity to flaunt your love of antlers and unlocking things. Here is a stylized portrait of a fox with exaggerated lines through the fur to make the animal appear fluffier. 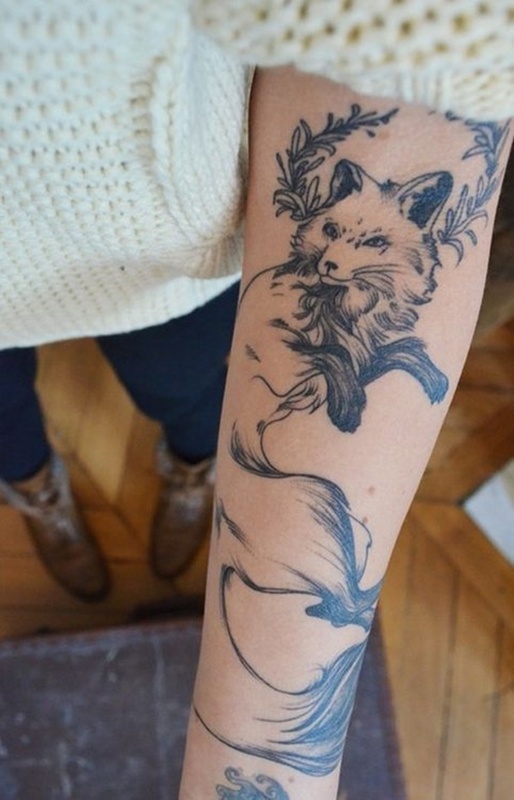 The fox is said to represent luck and mischief. A Mexican inspired pattern runs the length of her arm and is accented with dermal piercings on the back of her wrist and her bicep. 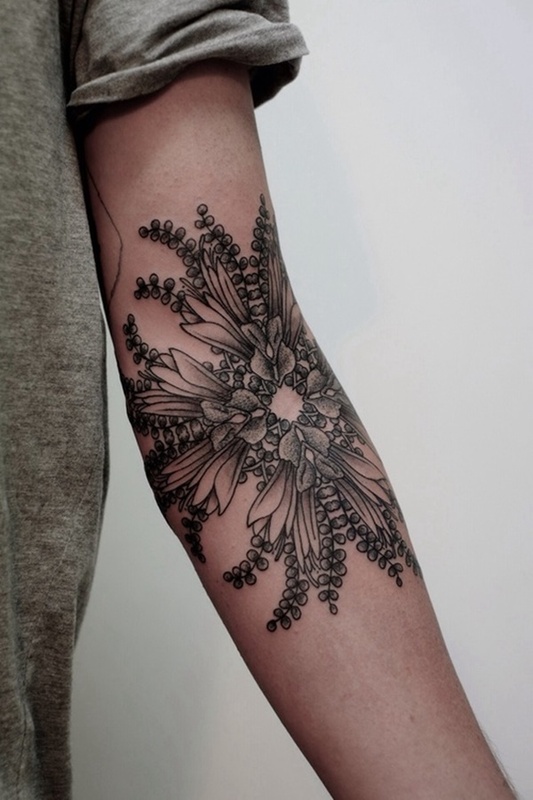 The tightly grouped flowers and overlapping leaves make this simple black and gray tattoo a standout. Geometric shapes offer a sense of complexity to a repeating pattern that intrigues the eye. While crossed revolvers are a traditionally masculine image, a splash of pink adds a feminine touch and makes the tattoo pop. An embellished portrait is framed by a rose, a lighthouse, and the sun. The small details of this tattoo create the appeal, a flock of birds flies into the distance as the sun burns brightly above. The elements in the background bring the portrait in the foreground to life. 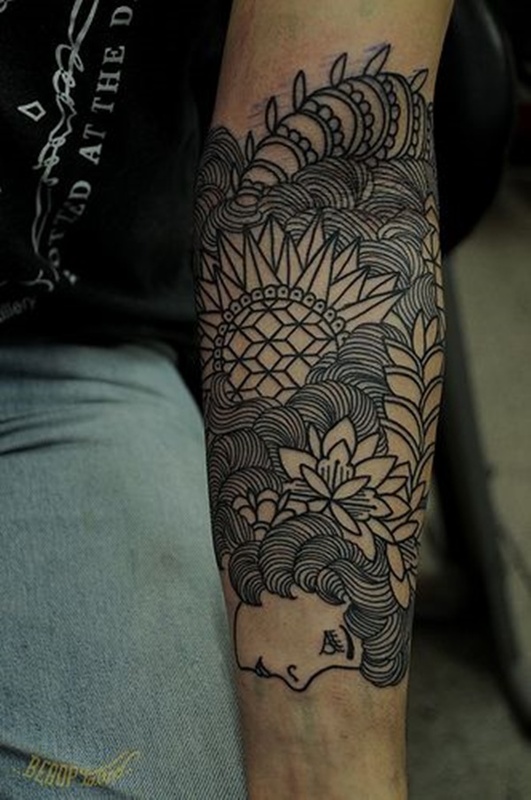 A black and gray rendition on a lotus and some Indian inspired patterns. The use of shading and pointillism on the petals of the lotus are the type of minuscule details that separate a good tattoo from a great tattoo. You will share your tattoos with people, but your tattoos, are yours alone. Every illustration should have an undeniable appeal to you. your tattoos tell a story and it’s okay if you’re the only one who can read it. The artist has created a tapestry of patterns in a simple black and gray motif. Using lotuses to anchor the pattern they complimented the flowers with elaborate scroll-work and repeating patterns. 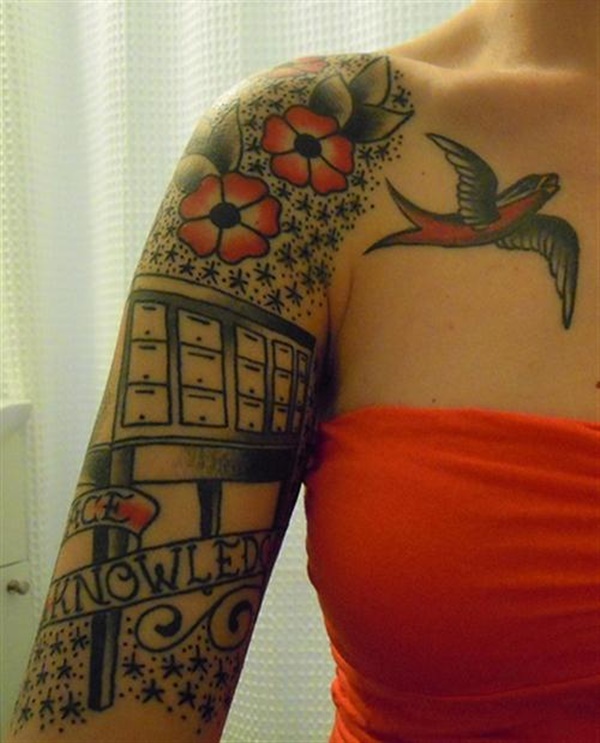 A gorgeous example of a decadent tattoo. This sleeve is an example of an extraordinarily talented tattoo artist. Their mastery of the traditional depiction of the gypsy woman is evident in the line work and use of color. The gypsy’s eye shadow and rouge are easily distinguishable from a distance as a result of expertly distributed color. More subdued colors create a bolder appearance and compliment certain subject matter. 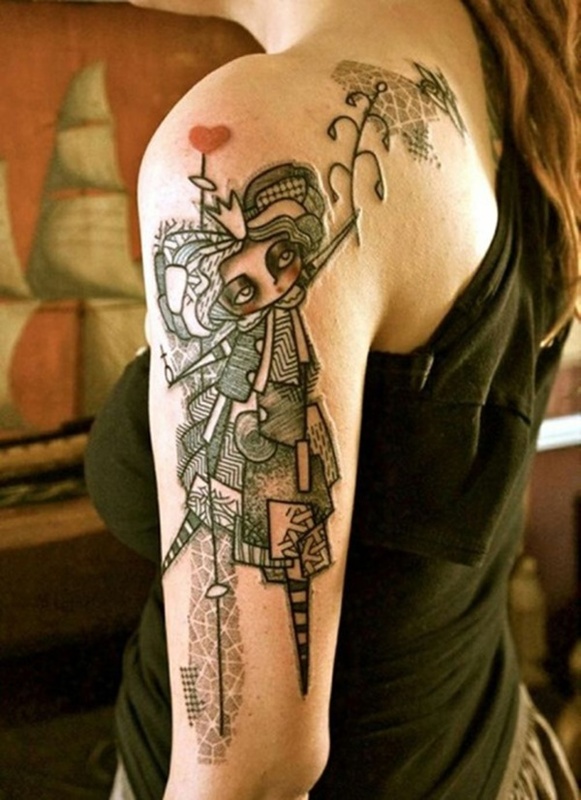 This tattoo is a calculated combination of quirkiness and cuteness. The unconventional font, emphasized coloring in the bird, and flower border mesh well with each other and create a sense of unity throughout the piece. Butterflies are a common image in women’s tattoos and blue ink has been prevalent in tattooing for centuries, the Romans wrote of Briton tribes being covered in vibrant blue tattoos depicting trees. While the technology and social stigma of tattoos has changed since the days of ancient Rome, blue ink is just as striking. Simple black and white stencil style portraits pop against a backdrop of crimson swirls. White ink is typically more expensive than other inks and generally doesn’t last as long. However, if you’re willing to make additional trips for touch ups, white ink can compliment the simplest of color palettes including black and gray. The vivid colors and commendable use of shadowing create depth in this image of three rosebuds. This woman has an obscure collection of portraits portraying people with animal skins on their heads. The tattoos are well done and the content is eclectic to say the least. The emphasis is on the negative space in this tattoo as the green vines surround the colorless pedals of flowers. Vivid colors create a lively collage of mandala-like patterns and flowers. The intense blues and purples are so vibrant they’re almost fluorescent. 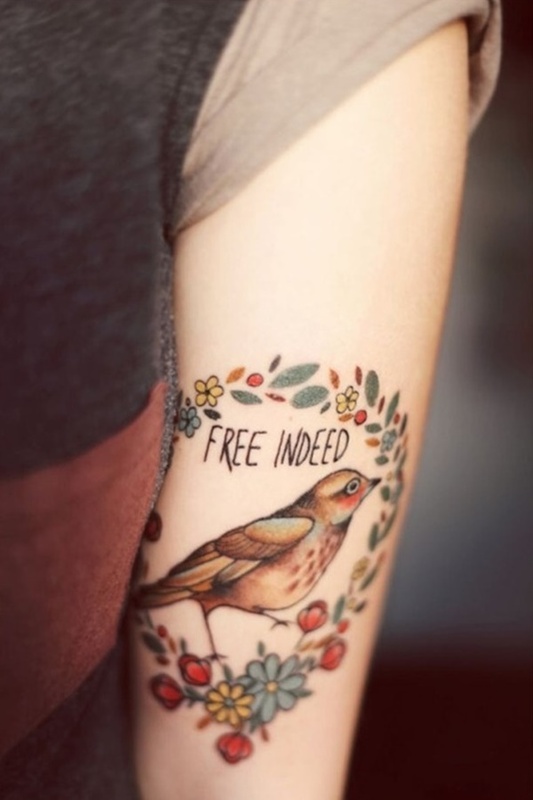 Everything is done right with this tattoo, the nature scene is well drawn and the impeccable choice of colors animates the tattoo without overpowering the illustrations. The wrapped appearance of the wrist offers a unique accent to a sleeve. A simple doll drawing with blushing cheeks and a floral pattern covering the bottom half. Uncomplicated, expressive, and straight to the point. 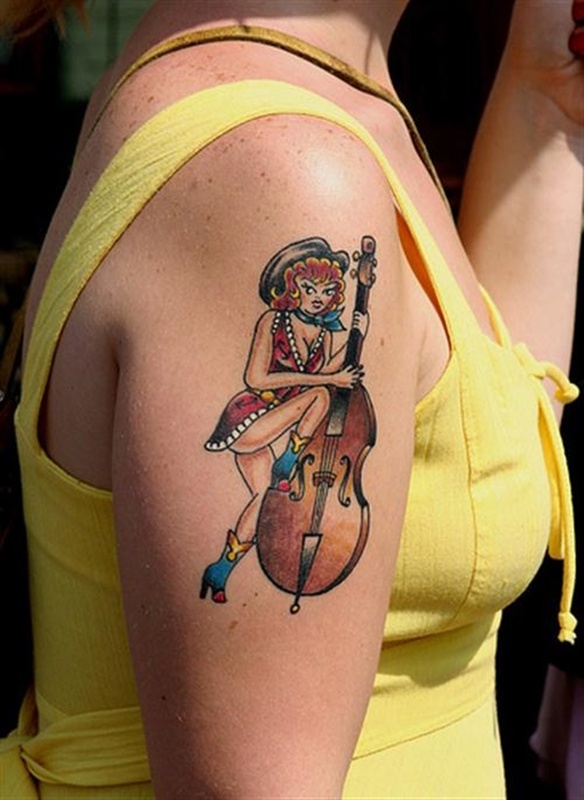 The focal point of this tattoo is the cartoon style pin-up girl with the “Fool’s Gold” banner. The tattoo is sharp and does a good job of conveying the personality of the wearer. Nothing looks more uniform then meticulously aligned text. A well done script tattoo makes people want to lean in and read the text, as this tattoo does. Water and fire are represented with the blue and red patterns respectively. 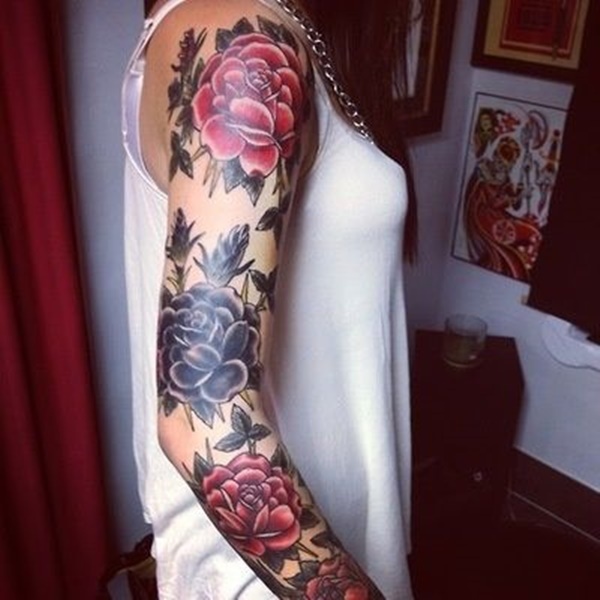 Flowers are superimposed over the image and the contrasting colors give the tattoo warmth. 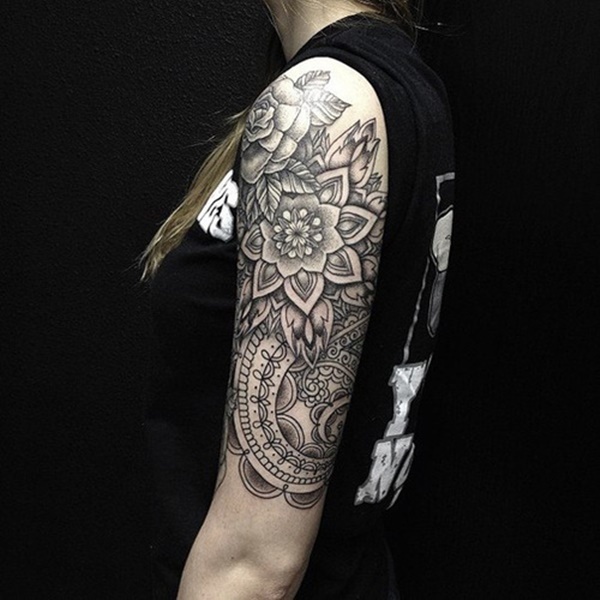 A beautiful example of black and gray tattooing. Notice the light gleaming in the owl’s eye and the white knuckles conveying the owl’s tight grip. An absolutely gorgeous piece, a series of meticulously detailed shapes feed into one another and comprise an astonishing tattoo. Once again, simple shapes, the simplest color palette, and the foresight to use the wearer’s skin tone to contrast with the ink. 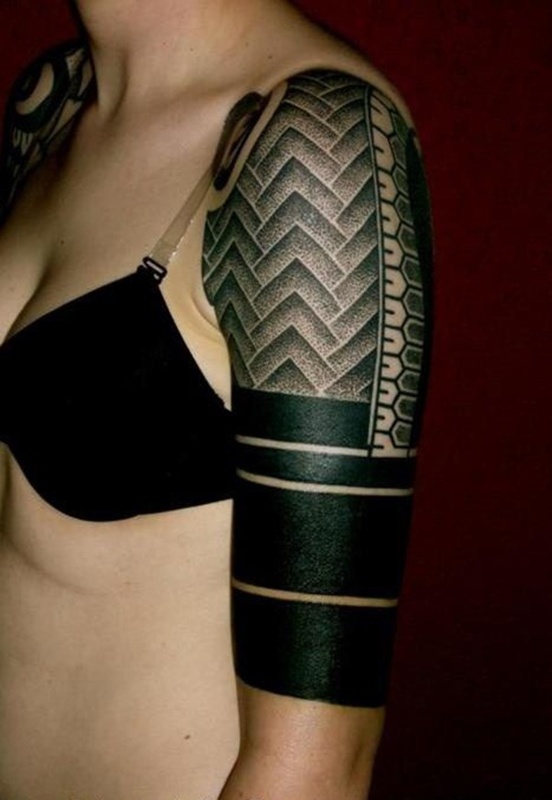 Black ink and intricate patterns compose this imitation of traditional Polynesian tattoos. Bold colors and imagery displaying a skull with a gold tooth, among an adorable shark, and flowers. 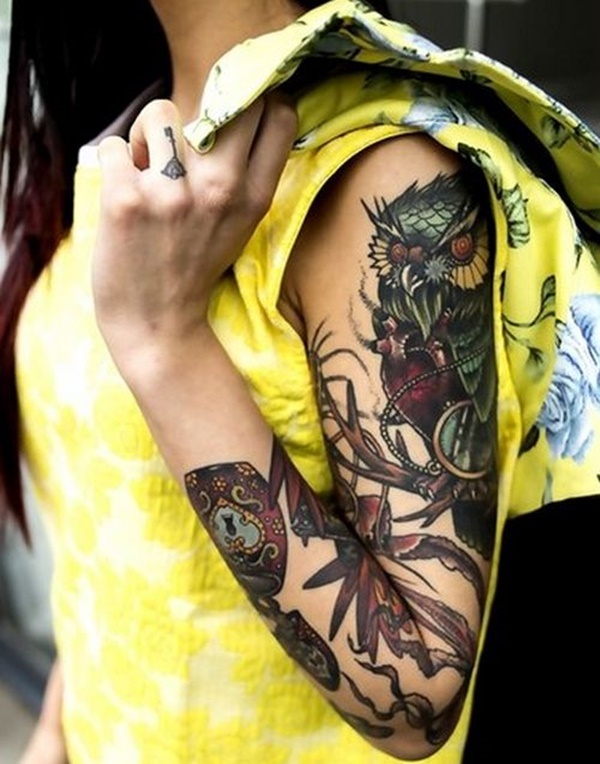 A bird theme is the common denominator throughout this woman’s sleeve. The silhouettes compliment the piece on her forearm while the royal bird on her bicep is the focal point of her arm. 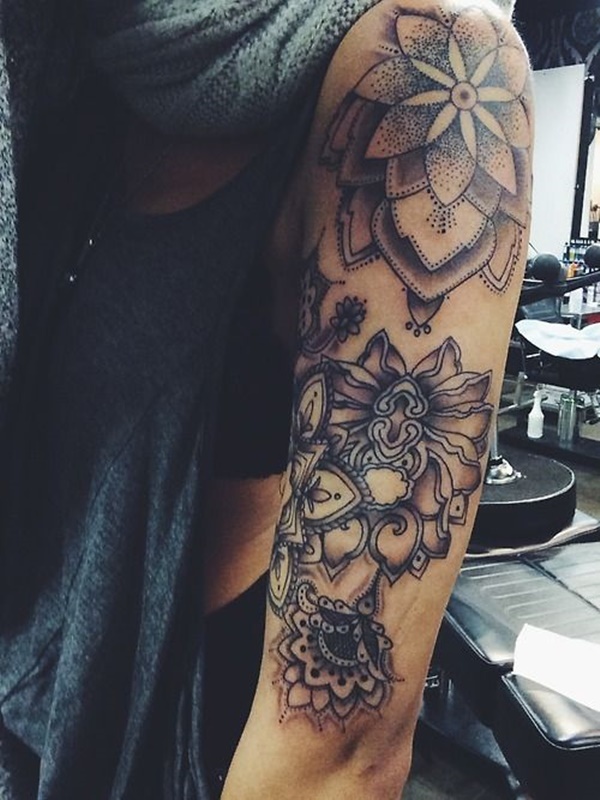 A mandala like pattern is the basis for this striking sleeve, simple yet elaborate. Another angle of the sleeve we saw earlier. 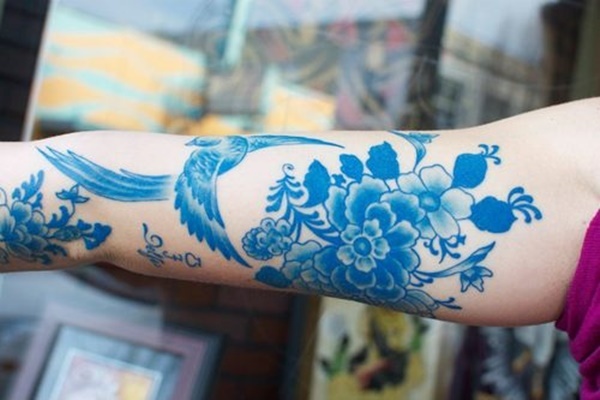 Three blue and orange sparrows adorn this woman’s arm and offer some continuity to her sleeve. A reoccurring image should create a sense of cohesion throughout a tattoo without becoming redundant. Comic books of yesteryear used a four color printing process for their comics. The portrait on her upper arm is clearly in a classic comic book style and serves as an intriguing focal point for the rest of her sleeve. A gorgeous rendition of an owl using a color palette of muted greens and reds. The circular pattern in the eye gives the owl life while creating a sense of mischievousness. A beautiful beach scene utilizing the silhouette of palm trees against the sunset, an “over under” technique for the water, and realistic portraits of sea creatures. 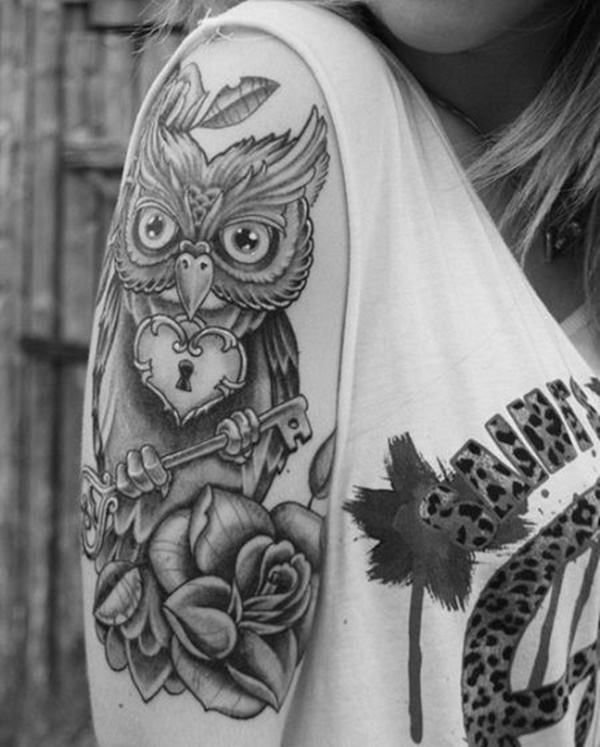 Another owl and lock tattoo, however this piece sets itself apart by utilizing elaborate patterns throughout the tattoo. 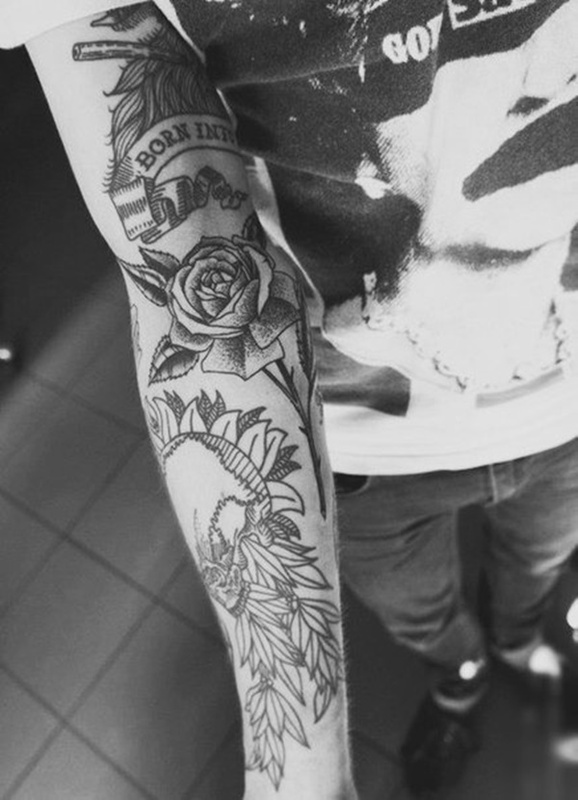 Flowers are a simple and beautiful subject for a tattoo. Symmetry is essential when planning a patterned tattoo. Notice the series of pointed shapes above the solid black bars that wrap around her arm. They have no outline, they are expertly shaded to create the shape. The portrait on this woman’s arm is inherently her own. The details make the piece unique, from the subdued smirk to the cigarette hanging from the subject’s lips. A nature scene rife with blues and greens is accentuated by pops of red color represented in the lotus flowers and the gecko lizard. 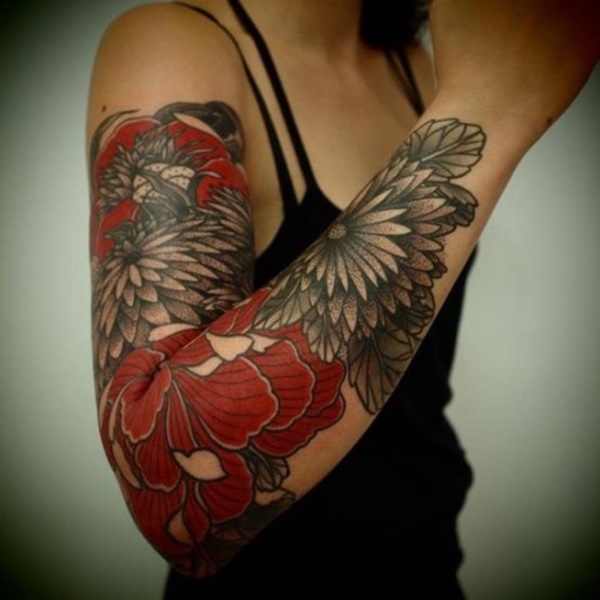 Run of the mill black and gray tattoos are livened up by an injection of red throughout the tattoos. Once again we see the black, gray, and red color palette utilized. However, this tattoos line work leaves something to be desired as it is visibly shaky. A well detailed butterfly and lily overlap a swirling pattern that can represent wind or water. Obviously this woman loves hats, as evidenced by her wearing a hat as well as her forearm tattoo of a steampunk inspired gentleman wearing a checkerboard top hat. The consistent use of blue creates a nice sense of continuity in this sleeve. However, the blue man that graces her upper arm has shaky line work and would have benefited from a steadier hand. A full color interpretation of the Hindu goddess Vishnu is the centerpiece for this sleeve. The portrait transitions into flowers that create separation from the repeating pattern on her forearm while giving continuity to the piece. A remarkable portrait of Scarlett Johansson graces her forearm while the positioning of her opposite arm makes the tattoos indistinguishable. A barren tree and a Celtic cross lend this tattoo a sense of severity. A collection of mandalas and animals that run the length of her arm are emphasized by the negative space that surrounds each piece. Notice how each piece stands alone, like art on a wall, and is easily distinguishable from the surrounding art. Also notice how dreadfully uncomfortable that deer looks. A bird fleeing captivity, a simple, classic, and compelling image. 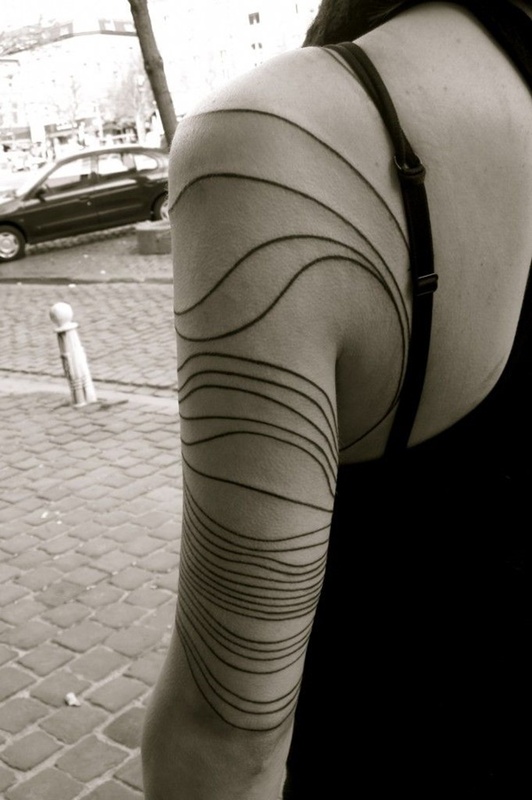 A series of abstract shape converges toward the center of her forearm. While the pedals create a sense of plant life, looking at the pieces individually evokes thoughts of honey bees. A simple black and gray portrait. 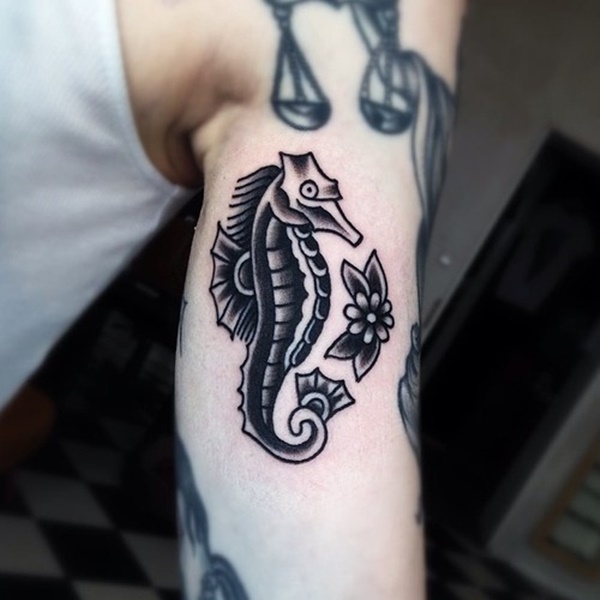 The subject matter sets this tattoo apart as sea horses are not a commonly seen image in tattooing. For centuries blue ink has been utilized by ancient civilizations and tribes including the Inuit and Britons. This tattoo shows why, blue ink creates stunning artwork. What Kind of Conditioner Does She Use? The most impressive and striking detail of this tattoo is the shading and line work in the hair. This technique creates a sense of depth and life. 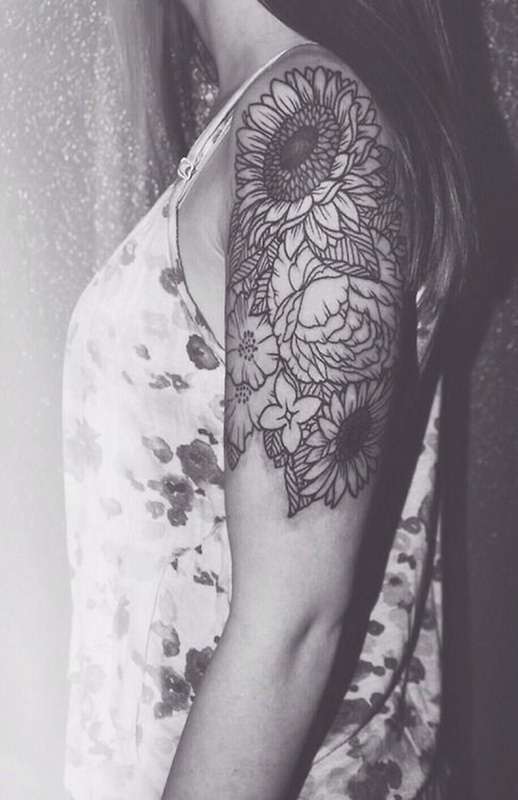 Mandalas are an undeniably beautiful subject for tattoos, as evidenced by this woman’s sleeve. When deciding on a tattoo involving lines of text, emphasis should be placed on font and spacing. It doesn’t hurt to offer the script some framing as well, as this woman has done with the surrounding birds. Considering lotuses are a traditionally Japanese symbol it is fitting to compliment the awe-inspiring flowers with some Japanese characters. However, whenever you’re considering being tattooed in another language, fact check as much as physically possible! You don’t want to be tattooed with a character that has no meaning or worse yet, a negative connotation. 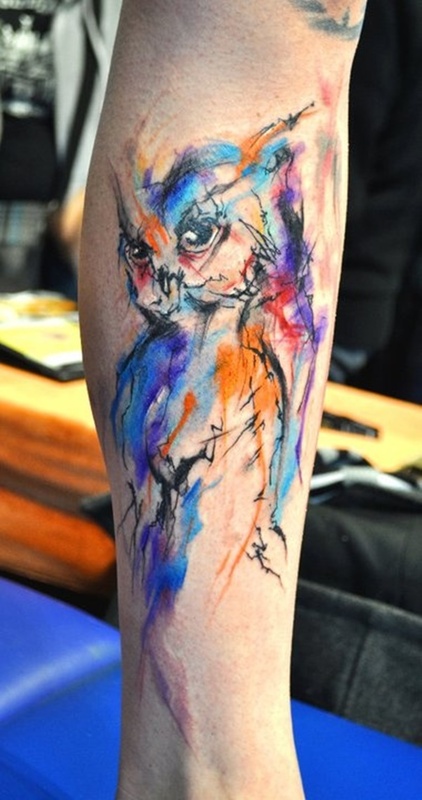 A unique tattoo depicting a sketched owl embellished with streaks of color reminiscent of watercolor paints. 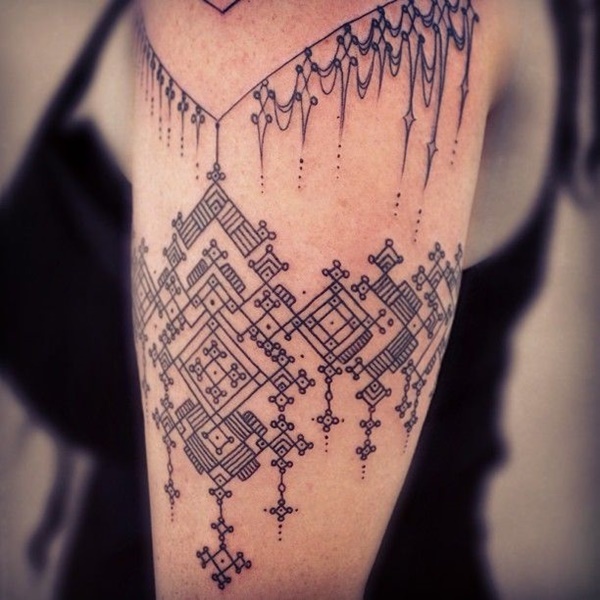 A beautiful example of abstract tattooing. 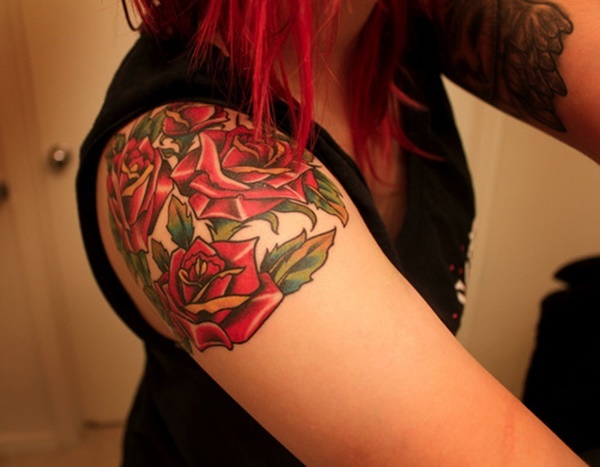 Flowers are a safe and aesthetically appealing image for a tattoo. Assuming that you’re working with a competent tattoo artist. I can’t tell if the asymmetry of this bear is a stylistic choice or the result of an unsteady hand. Regardless, the heavy black lines that compose the image create an eye catching tattoo. No one said you couldn’t sprinkle adorable animals throughout your flower motif…at least I didn’t. 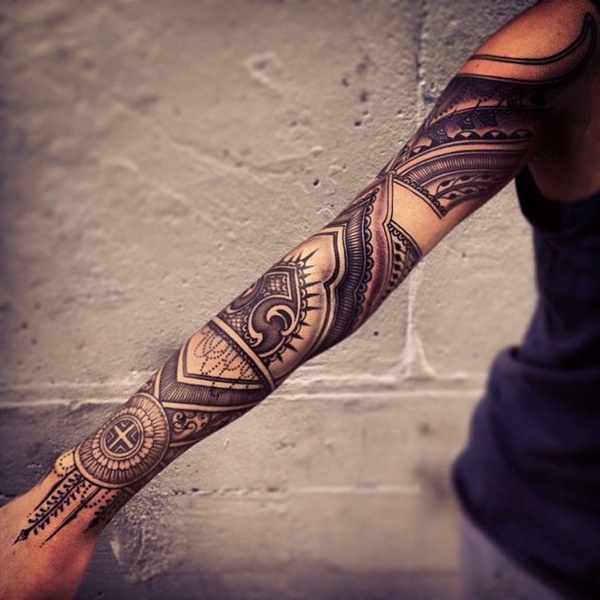 The design of this tattoo is so elaborate and fascinating that the artist only had to outline the tattoo. The lack of shading and colors creates less room for error with a remarkable result. A truly obscure image, a buck with arrows jutting from his body, flowers on his antlers, and exaggeratedly long eyelashes. Remember that your tattoos are yours alone, get what you like. 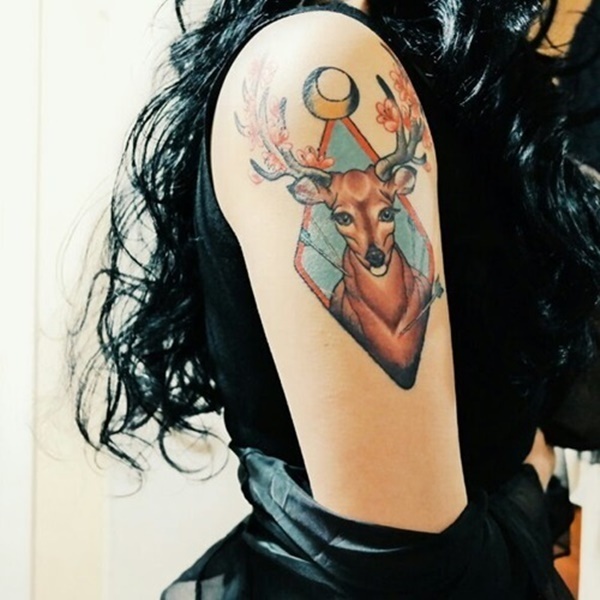 Another angle of the tattoo we saw earlier makes me genuinely concerned for the deer on her forearm. What could she have requested from her tattoo artist to make them position the animal like that? I can only imagine that she requested a deer that is falling from a skyscraper. 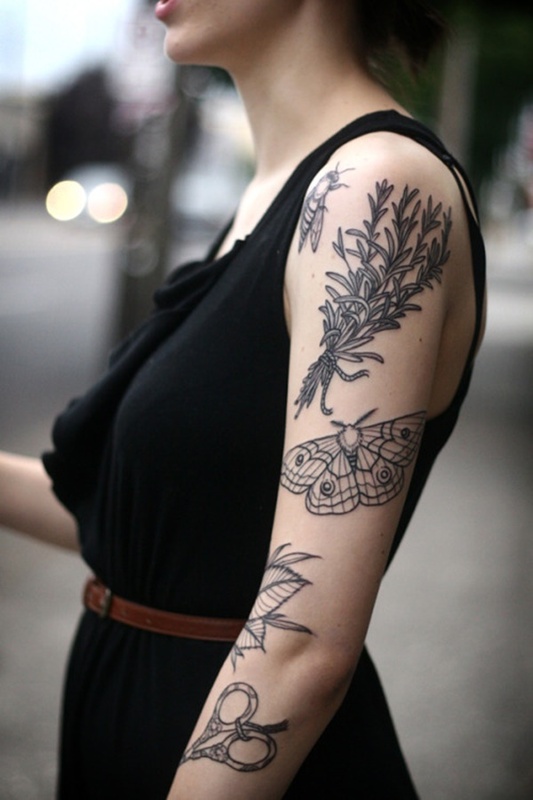 The separation of the piece on her upper arm and the piece on her wrist creates a striking image. 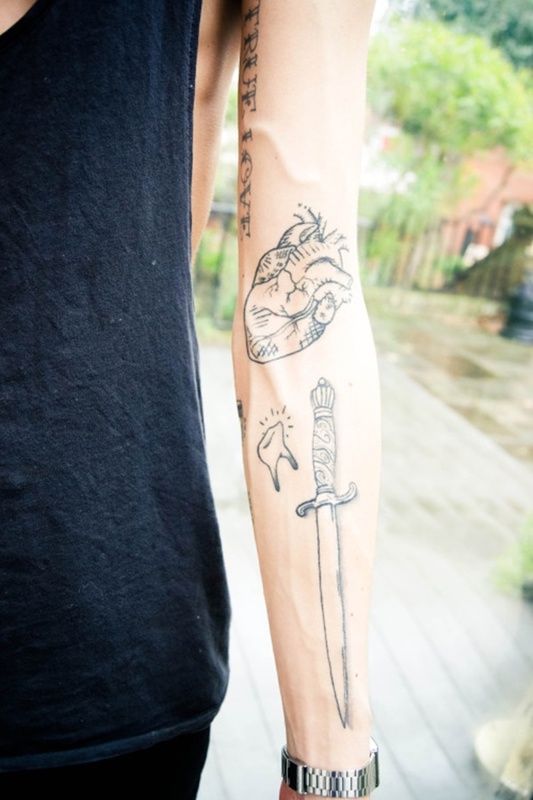 The negative space serves to frame the tattoos, and gives the effect of a full sleeve without the additional work. Simplicity is the key detail of these tattoos, no color, no shading, simple black outlines create bold images. While peaking in popularity during the acid craze of the 60s, optical illusions have been prevalent ever since. As evidenced here, the strategic use of shapes can make a series of black lines extraordinary. Strong black lines comprise this interpretation of two rosebuds. Colors and techniques typically used in traditional tattooing create this portrayal of an owl. 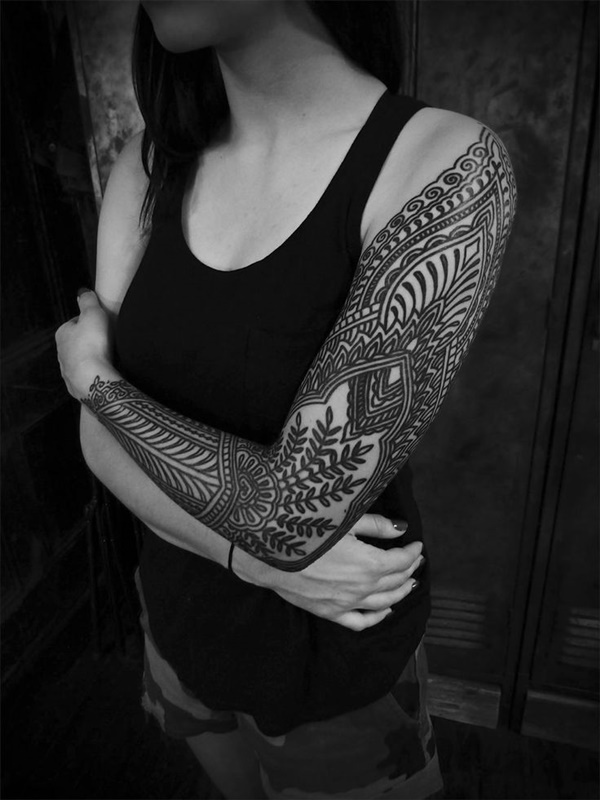 I also notice some subtle Native American influences in the patterns, a tattoo doesn’t need to adhere to any one style. The juxtaposition of a skull embellished with accessories that are associated with the upper class keeps this piece interesting. 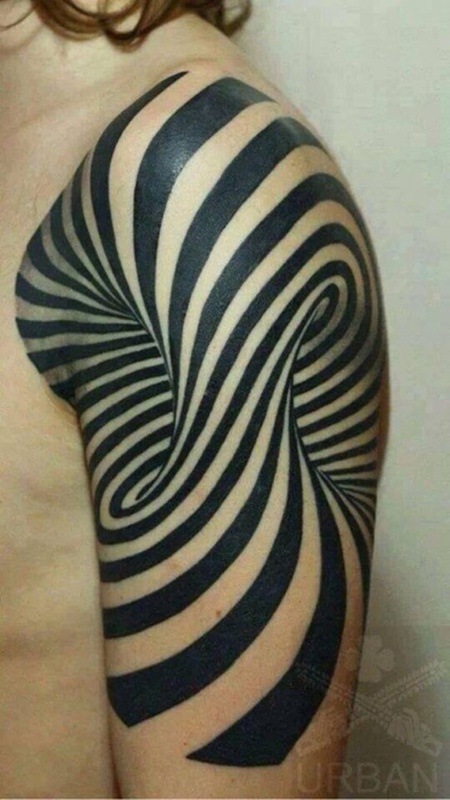 While not an exact example of cubism, the technique of composing the image with a series of blocks makes this already unique tattoo even more fascinating. Impeccable shading and the addition of thorns are the hallmarks of this flower tattoo. Notice how this skull is missing its lower mandible and is decorated with the leaves of a plant. No framing is needed for this tiger portrait. The image is so impeccably well drawn that the subject is conveyed by showing only a portion of the tiger’s face. 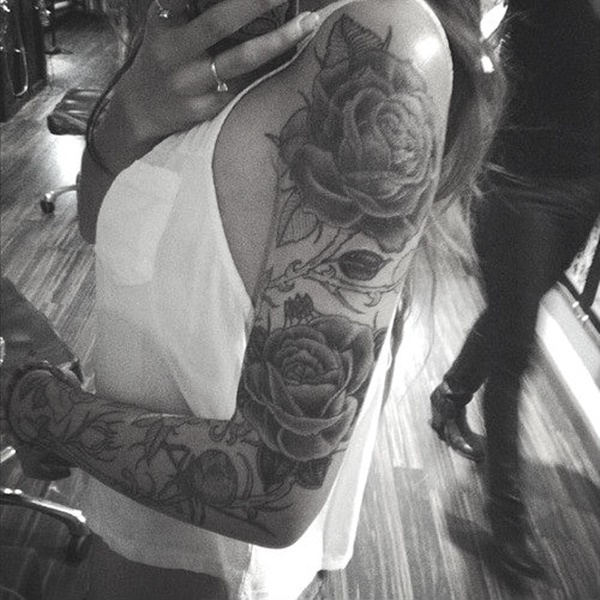 Black and gray is the decided color on her sleeve, adhering to a color palette keeps the tattoo from appearing cluttered. 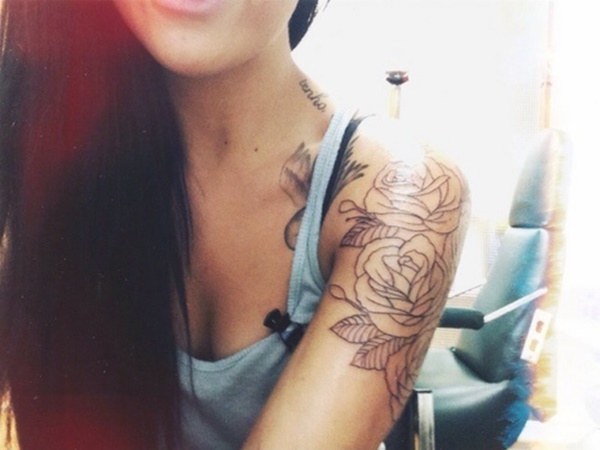 You will be paying for your tattoos individually and you want them to be distinct. 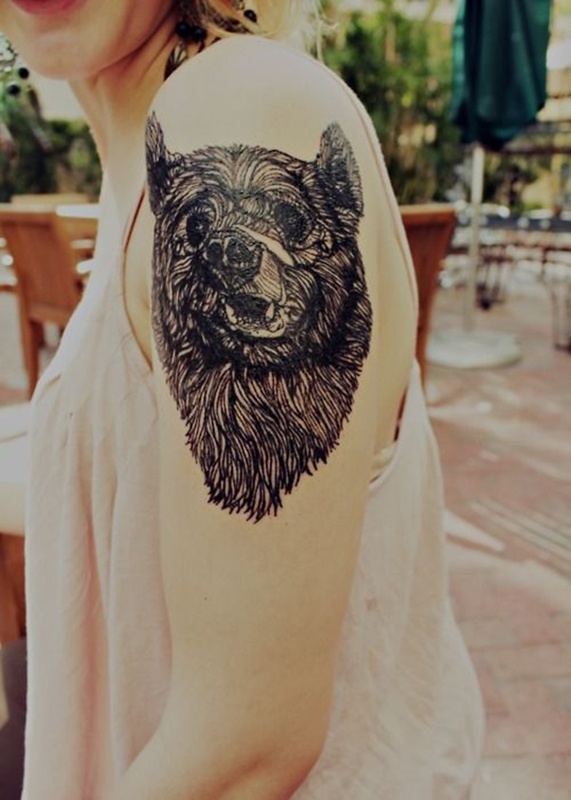 The lighting in this photo makes the tattoos difficult to distinguish so I will be commenting on the dog instead. 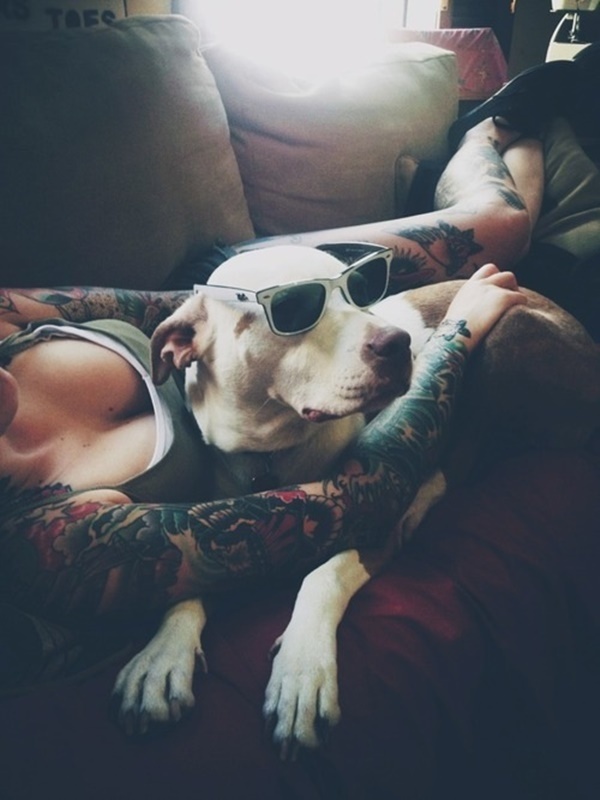 Cool dog, enough said. A tooth is definitely an obscure subject for a tattoo, but even more concerning is the use of lines around the tooth. In comic books similar tactics are used to convey what’s happening in an illustration. My guess would be that someone has a tooth ache. 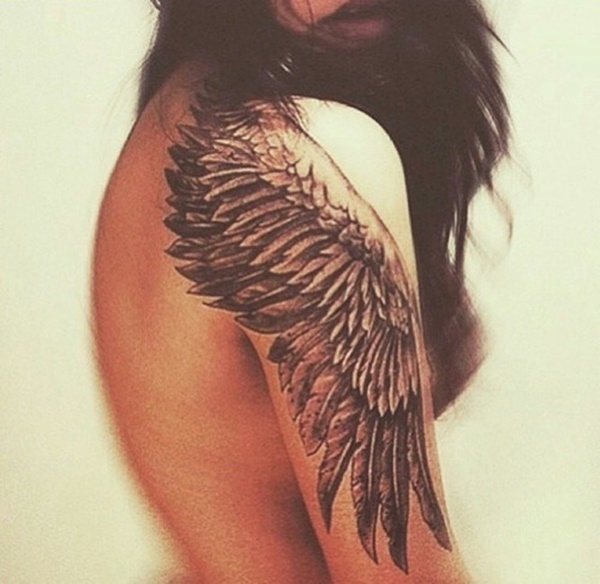 A well done rendition of a birds wing descending this woman’s arm, simply the result of a superb artist. The most impressive aspect of this tattoo is the placement. 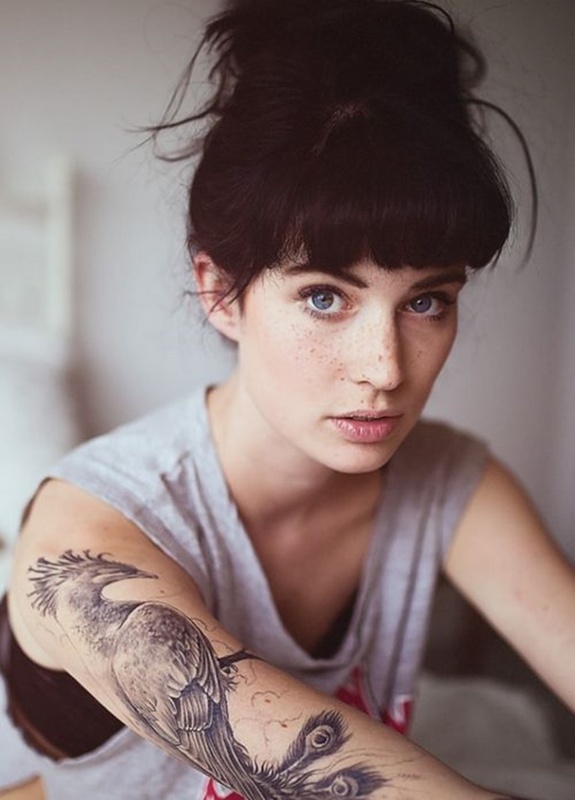 Slightly below the typical position for an upper arm tattoo and just above the elbow. Subtleties like placement can make a world of difference for the reception of your tattoo. This quirky portrait depicts a raccoon wearing a suit. I don’t know his name, I don’t know his story, but I would like to learn more about this nocturnal dandy. A charming depiction of a cowgirl playing a stand up bass. 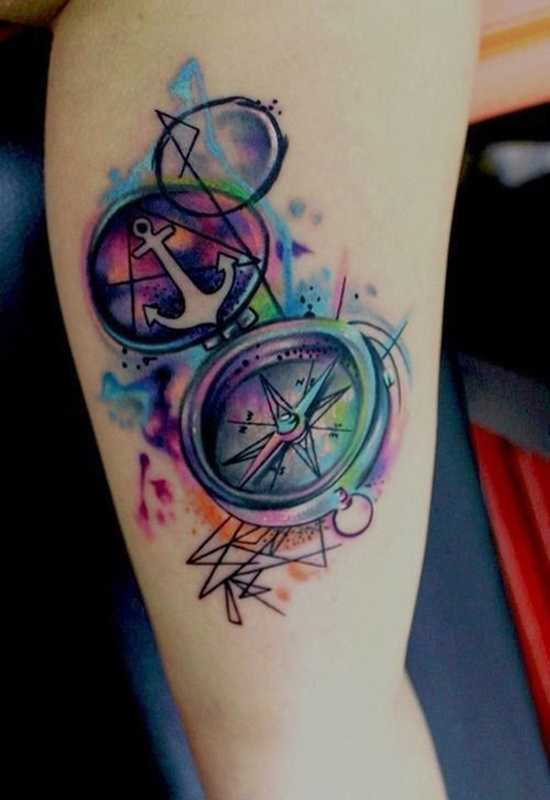 This is a beautiful tattoo depicting a compass with an array of vibrant colors. I can only assume this tattoo is the result of a love of sailing, and hallucinogens. Take note of the nautical star surrounded by roses, while both are popular images in modern tattooing you don’t often see the two pieces together.